NOTIFICATION: Indian Army (Government of India, Ministry of Defence) inviting online applications for filling up 96 vacant posts of Junior Commissioned Officer for RRT 87 & 88 course from eligible and interested willing male candidates. It is latest & good information for unemployed personnel those who are looking for these new Jobs in Government sector & other organizations. 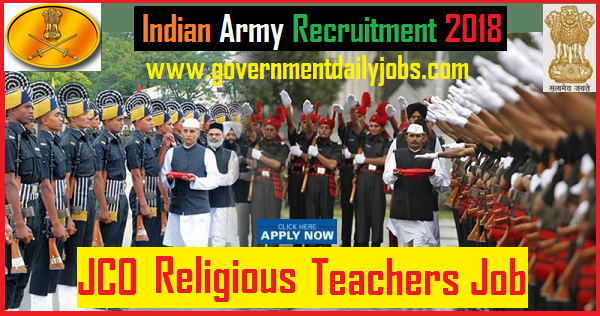 Job seekers, who wish to apply for these vacancies regarding Indian Army JCO Religious Teachers Recruitment 2018, must have passed Graduate /Posts Graduate/B.Ed/Ph. D in concerned discipline with a required experience if asked. Applicant’s upper age should be as per Govt rules and age relaxation is applicable to all reserved category candidates i.e.SC/ST/OBC candidates etc. PLACE OF POSTING: All India. NO OF POSTS: 96 vacant posts of Junior Commissioned Officer for RRT 87 & 88 course in various disciplines in Indian Army. 2. Pandit (Gorkha) for Gorkha Regiments: 03 post. 4. Maulvi (Sunni): 05 post. 5. Maulvi (Shia) for Ladakh Scouts: 01 post. 7. Bodh Monk (Mahayana) for Ladakh Scouts: 01 post. 1. Pandit and Pandit (Gorkha) for Gorkha Regiment: Hindu candidates with Acharya in Sanskrit (OR) Shastri in Sanskrit with one-year diploma in 'Karam Kand'. Hindu candidates with Madhyama in Sanskrit or Bhushan in Hindi or equivalent standard in the regional language concerned OR those who have passed BA with Sanskrit /Hindi as one of the elective (Main) subjects but have not done Madhyama in Sanskrit or Bhushan in Hindi. 2. Granthi: Sikh candidates with Gyani' in Punjabi/Sikh Candidates with Vidwan in Punjabi or equivalent standard in the regional language concerned OR those who have passed BA with Punjabi as one of the elective (main) subjects but have not done Vidwan in Punjabi. 3. Maulvi and Maulvi (Shia) for Ladakh Scouts: Muslim candidates with Maulvi Alim in Arabic or Adib Alim in Urdu/Muslim Shia ladakh personnel candidates with Maulvi Alim in Arabic, Adib Alim in Urdu or equivalent standard in the regional language concerned OR those who have passed BA with Arabic/Urdu as one of the elective (Main) subject but who have not done Maulvi Alim in Arabic/ Adib Alim in Urdu. 4. Bodh Monk (Mahayana): Buddhist (Mahayana) candidates who have been ordained Monk/ Buddhist Priest, by the Appropriate Authority. The term Appropriate Authority will mean Head Priest of the Monastery where the person has been initiated into priesthood. The head priest should be in possession of Geshe (PhD) of Khanpa or Lopon or Rabjam with proper certificate from Monastery/ Budhist (Mahayana) candidates who have been ordained Monk/Budhist Priest, by the Appropriate Authority. The term Appropriate Authority will mean Head Priest of the Monastery where the person has been initiated into priesthood. The head priest should be in possession of Geshe (Ph.D) of Khanpa or Lopon or Rabjam with proper certificate from Monastery. 5. Padre: Christian candidates who have been ordained priesthood by the appropriate ecclesiastical authority and are still on the approved list of the local Bishop. DUTIES: Religious Teachers preach religious scriptures to troops and conduct various rituals at Regimental/Unit religious institutions. Their duties also include attending funerals, ministering to the sick in hospitals, reading prayers with the convalescents, visiting soldiers undergoing sentence, giving special religious instructions to the children and enlisted boys besides attending generally to the religious institutions and welfare of the Officers, Soldiers and their families. AGE LIMIT: Candidate’s required age should be in between of 25-34 years as on 01-01-2019 i.e. candidates born between 01 Oct 1985 and 30 Sep 1994 inclusive of both dates. AGE RELAXATION: As per Govt rules age relaxation is applicable for said post to all reserved category candidates. PAY SCALE: Rs. 9300-34800/-+ GP Rs. 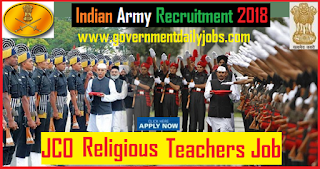 4200/-+MSP for Indian Army Recruitment 2018 for JCO Religious Teacher 96 Posts. REQUIRED APPLICATION FEE: For said vacancy a non refundable application fee is to be paid by the candidates as per rules. No fee required. POST RESERVATION: All reserved category candidates ie. SC/ST/OBC (as applicable) is being selected for said post/s as per existing Govt policy/rules. Physical Standard: As applicable to the regular Army (Height-155cm, Weight-50 Kg, Chest - 77 cms), candidate should be able to run one mile in 8 minutes. Medical Standards: (a) A candidate should have robust physique and mental health, chest should be well developed having minimum 5 cm expansion, should have normal hearing with each ear, should have sufficient number of natural teeth, i.e. 14 dental points with healthy gums. Candidates should not have diseases like deformity of bones, hydrocele, varicose veins or piles. (b) Candidates may contact nearest recruiting office / zones of the advertisement for existing rules on acceptable medical standards. भारतीय सेना में विभिन्न प्रकार के सैनिक बनने की प्रक्रिया. 6. Preparation of Merit List and Allotment of Arms and Services. 7. Enrolment & Dispatch of selected candidates to Training Centres. Written Examination: The written examination which will be conducted on 24 Feb 2019. Terms of Enrollment: 1. Candidates finally selected will be enrolled as JCO (RT) and will undergo 06 weeks of Basic training at BEG and Centre, Kirkee followed by 11 weeks of training specific to religious denominations as applied by the candidates at Institute of National Integration (INI), Pune. 2. On successful completion of training the candidates will be commissioned as Religious Teachers in the rank of Naib Subedar as per existing terms and conditions. Rejection can take place at any stage during training also. HOW TO APPLY: For said posts (Indian Army Recruitment 2018 JCO Religious Teacher 96 Vacancy) eligible, willing and interested candidates may apply through online at official website up to last date. The applicants must retain a hard copy for future reference. CONCLUSION: Indian Army invites online application for the recruitment of 96 vacant posts of Junior Commissioned Officer for RRT 87 & 88 in various disciplines on regular basis from Indian residents who are eligible & interested; candidates can apply through online application. LAST DATE TO APPLY: 03-11-2018 for Indian Army Recruitment 2018 of 96 Religious Teachers Vacancies of JCO.